Sponsoring a bunny brings extra special encouragement to our NTRS volunteers and bunny sponsors because they know that you care too. These bunnies patiently wait to be adopted into forever homes. They can only dream of unrestricted "Binkies" and "Bunny 500's." Surprisingly, sponsoring a rabbit in many cases somehow shortens the waiting time for your sponsored rabbit to get adopted! 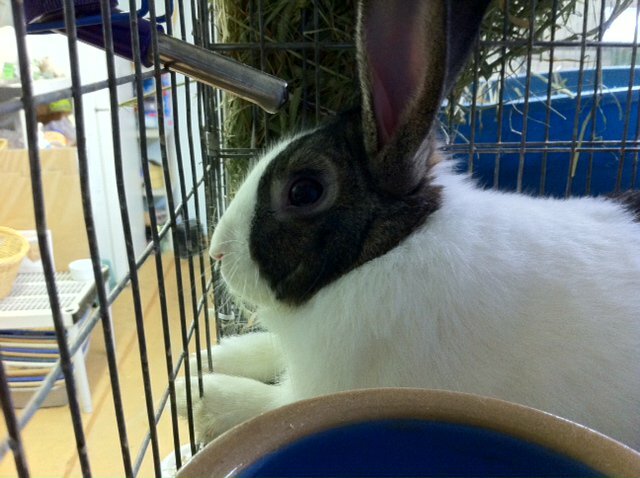 Several sponsors have reported that after a short period of time, their sponsored rabbit gets adopted, and they have to transfer their sponsorship to another rabbit. Indirectly, you are also saving another rabbit's life because an adopted rabbit leaves a space in NTRS for another rabbit to be rescued and given a second chance in life. This allows them to follow a new rabbit trail to be become a House Rabbit and do as many joyful "Binkies" and "Bunny 500's" for real in a loving home. For your sponsorship gift of $50 a year, you can sponsor a wonderful sanctuary bunny. The money will go to food, shelter, vet bills, and adoption campaigns for the rabbits here at NTRS. Your contribution will make a world of difference in their quality of life. and follow up your mail or online donation with an email to ntrs_tx@yahoo.com with "Sponsorship Program" in the subject line. Please include your name and address as well so that we can send you a handmade thank you card. You may begin your sponsorship by using one of the below options. Please make sure to specify "Sponsorship Program."